Seems like a good thing do. Eddie doesn't ask for much for running this show. In fact, nothing, as far as I can see. Must be worth a round of drinks or so to charity. This charity does its best to help them recover and gives support. I propose starting another fundraising page when this one ends in 47 days and this is an excellent candidate for inclusion. Eddie: I would be more than happy to donate 20 quid, how is this best done. I am overseas so would need to use a bank transfer from my UK account and I am not eligible for tax back. I'm overseas too - the site allows you to use PayPal or credit card. Can't claim tax back of course. Just found this (let's face it - I spend most of my time in Boys' Room) and I think it's a fine idea - especially the ever-changing beneficiaries. After just 2 weeks I think it's got off to a cracking start with 152 contributions totalling £3,493.50 (£4,237.50 taking Gift Aid into account). With another 41 days to go before it closes I'm still confident that the target of £10,000 us achievable but only if the other 3,000+ active forum members wake up and start counting the change in their pockets ;-). 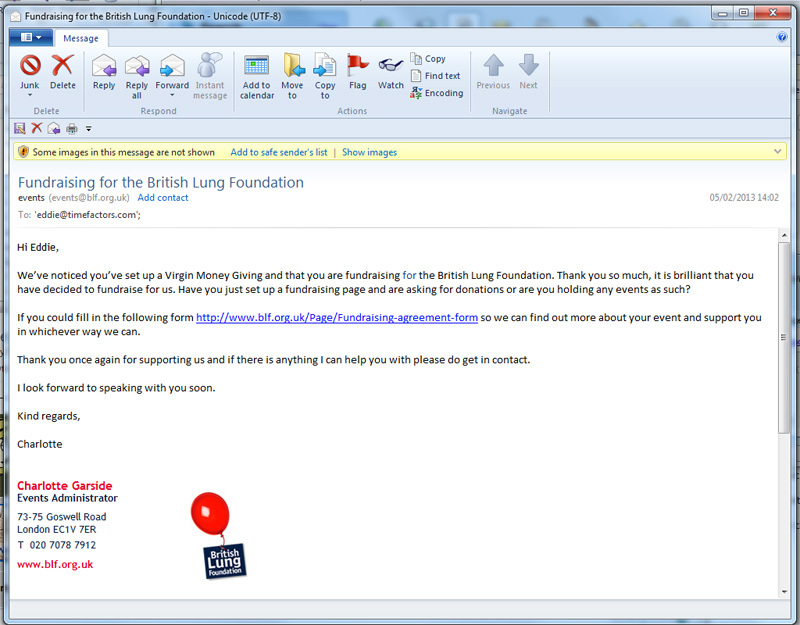 I previously posted an e-mail from ABC Animal Sanctuary, here's one from the British Lung Foundation just to let you know our efforts are appreciated. I would contribute without hesitation Eddie. No donations for almost 48 hours now :-(. More than eight hundred views of my free £200 G Shock offer, but just a handful of entries. Don't want to bump it too often, but ... seems the charitable feelings are perhaps tapped out for now. This charitable effort found while researching my next diver is what made me decide to buy a Precista instead of an MKII. Will visit free watch link as soon as post count permits. I assure any potential overseas donors that donation is not an issue with PayPal. One word of caution, though, your credit card company may charge an extra 3% for the transaction if you have that connected to your PayPal account, better to use direct bank transfer through PayPal. Last edited by GFloyd; 24th February 2013 at 17:41. Following a flurry of activity the fund now stands at just over 4K and a smidgeon under 5K with Gift aid. One remarkable donation of £200 (I think I know who yoiu are ;-) ) and a couple of £50. Still only about 4% of active members have donated and nowhere near everyone who uses Sales Corner. All donations welcome, no matter how small. good on you Eddie and good on everyone who has donated so far. I'm late to the party but happy to do my little bit and look forward to seeing where we can take this. Jut made a donation myself. Thanks for setting this up, Eddie. I think it's a very good idea. Congratulations to Eddie and all who have contributed - over half way there! So if there's anyone with some loose change floating around, you know what to do with it. If only 25% of those of us have already given could squeeze out another £10 we would be there. If I get paid this side of bank holiday weekend I'll kick another few quid in. Feels like it's been a long month! What's happening after this Eddie, new charity and start all over again or is this an occasional thing? It seems to have improved the general karma of the place this charity page! This one ends on 21 March and then there will be another with 5 new charities. This time I'll go for lesser-known charities. Brilliant, so a rolling fundraiser with the charities rotating every month. I don't know if it's been discussed, but has the option of a short delay before the next fundraiser been considered? I only mention as the great flurry of activity and generous donations we're seeing to reach the goal will likely mean that people suffer from some degree of 'charity exhaustion' in the immediate aftermath. I would hate for the next set of charities to miss out as folks are all 'charitied out' for a little while. Just a thought. Compassion fatigue I think it's termed. I believe the figures charting donations vs long-term or consecutive appeals show a drop off after a while (diminishing returns), but if given even a little time between appeals there was a higher rate of donations. Less than £150 to get to £10k. Come on guys. When the fundraising was announced I looked at the choice of charities and, given the target figure compared to the amount of traffic on this forum, I thought it would be exceeded by a large factor. As it turned out, many who use this forum did not contribute at all and it was through the efforts of a smallish group that the target was even reached. So well done to everyone who did: and yes, those who didn't contribute a thing should take a look at themselves. Super effort guys makes for a good feeling. As for the charity - great job done by the (real) TZ-UK community. I just sold a Bulova 23 jewel non-runner 'for parts' to dejjl (David EJJL) with proceeds going to Eddie's TZ UK Fundraiser. There must be must be a number of other non-runner watches laying dormant in forum members' collections so please consider passing them on via TZ UK SC for a donation to the Virgin moneygiving scheme. As you say there must be plenty of folk who have a decent cheapy or whatever they could auction or sell for the fund. I auctioned off a Smiths pocket watch and got a very good response from some generous TZ-ers. I'll have a trawl through for something else. Just out of interest,when is the current fundraiser period finishing,and the next one with the new charities starting? The current one has officially finished although the page will still accept donations. I'll give it a rest for a while before starting another, the current one has been a bit of a disappointment. Maybe a highlighted sticky in the TZ UK SC might remind sellers that a donation would be appreciated - especially if worded subtly but without sounding too threatening, or, on the other hand too 'Richard Nixon-ish'. But, on the other foot, maybe some of the regular (and regular+) '£'000s worth' sellers also need more of a 'not so subtle' kick to remind them. EDIT: Is it possible to incorporate a reminder into the actual SC listing draft e.g. a simple 'tick box' indicating that a donation will be made? Last edited by sundial; 22nd June 2013 at 13:00. Fair enough,although i don't personally think £5.5k is a disappointing amount to give to charity. The first one was always going to benefit from a groundswell of giving because it was 'new'. Subsequent donation periods were almost certainly going to be 'disappointing' compared to the first total. Less than £1000 has been donated to date during June. Furthermore, it's not just from sales that donations can be made. If someone places a WTB, both they and the seller could make a donation. It's obvious to me that some members are placing so many FS and also WTB posts that they're unlikely to be for watches for their own use/pleasure ie they are probably 'dealing' to make ££ - and some do not make donations (unless they hide under the 'Anonymous' handle) They are ripe fodder for commencing an 'ignore' list if I decide to sell any box office watches. It's a simple matter to scan through the listed donors and ascertain who has not contributed - took me less than a minute looking for one suspect individual for whom there is no trace of a donation. Last edited by sundial; 22nd June 2013 at 13:33. Though some, like me, think any contribution I make is nobody's business but mine, so anonymous it is. How do I donate? The Virgin money page says the donations are closed? Did you click on the banner at the top of this page? It works fine for me. Last edited by asteclaru; 20th August 2015 at 12:35. Eddie, how about a modest fee for the sales thread? Or maybe its been suggested? After all, i'd say theres a far greater rate of success selling your watch on here than ebay and you dont pay the listing fee or the ebay AND Paypal commission fee. I'd think something like a pound or two per listing would be i nice little charity earner running in the background and wouldn't upset any genuine member as they'd still be financially ahead of ebay on even a 30 quid sale. Indeed it would, but would still be an earner for charity nonetheless. 70p out of every pound over 20 posts a day mounts up to over 5k a year and a lot of good things can still be done with 5k.